Among live-action comic book adaptations, Batman’s 40-plus year pendulum swing from camp to goth and back again — from the Sixties TV series’ pop-art corniness to Tim Burton’s expressionist Art Deco to Joel Schumacher’s plastic toy commercials to Christopher Nolan’s grounded psychodramas — reveals a profound ambivalence toward this hero. The familial trauma, chosen isolation, and violent extra-legal exploits of Bruce Wayne ask, perhaps, for serious depiction, and yet the earnestness of the character’s motives and the outlandishness of his adventures continually slide into self-parody and flamboyance — the average Batfan’s overprotective insistence that portrayals of the Caped Crusader must be kept “dark” seem desperate in the face of the inherent silliness that comes with grown men running around in makeup and costumes. Thus the films’ frequently conflicted intentions. Watch again, for example, Burton’s Batman (1989): For all the industrialism and fog-shrouded silhouettes, it’s also a garish exercise in rampant commercialism, even if audiences wish to forget that its obnoxious Prince soundtrack isn’t a far cry from Schumacher’s bat-skates and nippled body armor. Director Christopher Nolan, fans say, saved Batman in Batman Begins (2005) from Schumacher’s neon clutches and made him truly, deeply dark again. Interpreting a superhero these days as a brooding or rakish outcast, however, has become de rigueur. Superman is mopey; Iron Man is sarcastic; Hancock is surly; even Spider-Man infamously discovered his inner emo kid in the third installment of Sam Raimi’s series. It’s an old trick: emphasize a character’s troubled side to compensate apologetically for the infantile wish fulfillment his story actually represents: dreams of flying, swinging from skyscrapers, and inventing and employing villain-toppling gizmos legitimized by the “adult theme” of an outcast meditating on the nature of justice, love, redemption and the fact that with great power. You know the rest. With Ang Lee’s sensitive Hulk proving a dud, Batman Begins sparked the current revival of the “dark” comic book movie. It was a good attempt that fell short of greatness because — surprise, surprise — that nagging ridiculousness and juvenilia too frequently reared its ugly head, with the film’s 9/11 allegories and Bruce Wayne-in-mourning backstory undercut by Liam Neeson’s clichéd role as the pernicious master who must be defeated by the incorruptible pupil, as well as, among other sins, excessive cuts to bumbling policeman gawking at a tanked-up Batmobile. Lacking Burton’s grim fantasia of outsider superfreaks, the goofy touches to Nolan’s noirish take betrayed his convictions and uncovered his disappointing lack of visual and narrative imagination. The Dark Knight, Nolan’s practically salivated-over follow-up solves many of the problems in Begins by eradicating almost any traces of ridiculousness and instituting a relentless, unmitigated assault of self-doubt, anger, gruesomeness, nihilism and fear, all buttressed by a relatively sober realism. Nolan and brother Jonathan, the film’s co-writers, spend unprecedented screen time explicating the financial logistics of organized crime and the legal and political maneuverings of Gotham City’s District Attorney’s office and police force, with the result that The Dark Knight often plays like an episode of Homicide: Life on the Streets that happens to feature Batman. At moments The Dark Knight’s soundtrack goes completely atonal to match its palpable sense of menace, with bass drones straight out of Blue Velvet and high-pitched violin shrieks that sound like Tony Conrad’s music. 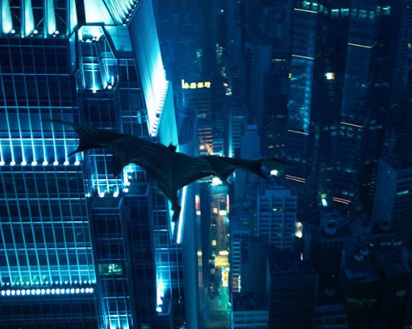 And despite the mostly incoherent spectacle of its chases and fights (swoops from buildings excluded), Gotham itself is not exaggerated in scale in order to evoke Batman’s comic-book origins. In The Dark Knight, Gotham — as given shape by Chicago, Nolan’s one-time hometown — assumes stature as a metropolis that could very well exist in the real world, and maybe already does.